Beth Porter: You have been drawn to the art of the people who have intellectual disabilities in L’Arche. What attracts you? Jacquie Boughner: All art is an extension of the body, and the body is something L’Arche understands, simply because the people of L’Arche often live with bodily limitations or need help caring for their bodies. I heard a choreographer once describe the act of creating as “the body in a free fall and then being caught”— that sensation of letting go and trusting. We don’t intellectualize this work as a narrative — we physically feel it as a gesture. L’Arche artists know and celebrate this, allowing the deepest impulse of our human reality to happen, to be expressed in creativity. To be creative is a part of being human. There is a freedom and truthfulness in their art. BP: Is the art of people with intellectual disabilities different then, from other art? JB: In art there is the indefinable that makes a work breathe. It’s a kind of mysterious tension between head and heart that gives life. The art of L’Arche is all about this breath and life that is found in the gesture of the body, by the act of painting, or drawing a line with immediacy, intensity. It represents a commitment to living fully in the moment. BP: Was there a moment when you began to notice the art of L’Arche members? 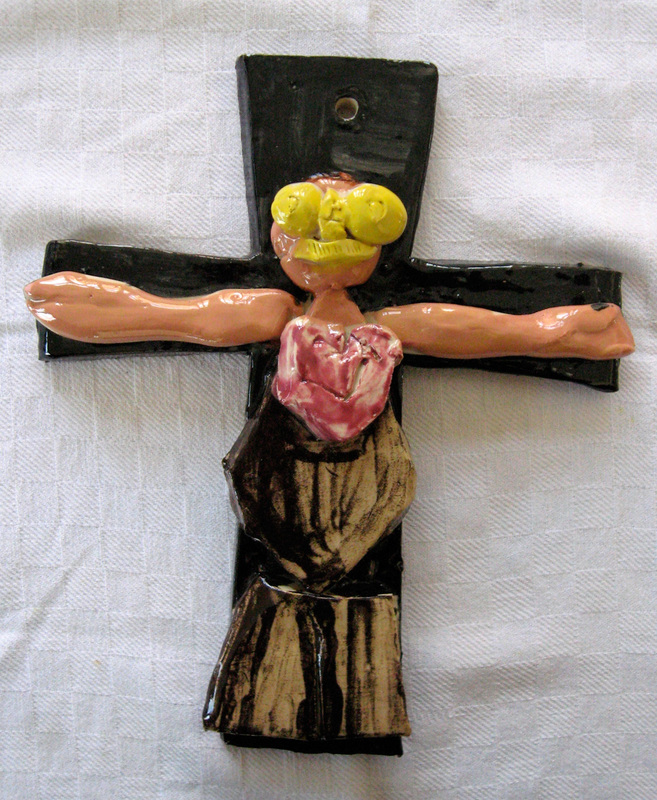 JB: I walked into the Craft Studio at L’Arche Daybreak and there was a display of Tom Krysiak’s ceramic crosses. There were colorful, cartoon-like characters pinned to each cross. One looked like Homer Simpson with a big, red, bleeding heart, and another had a ten gallon cowboy hat and a handle-bar mustache. I was mesmerized, confounded and shocked. My first thought was, “Is this blasphemy? Can it actually be religious art?” I have seen similar art objects, in a secular, ironic context—art objects created to outrage by using religious symbols in unorthodox contexts. Tom’s crosses were not done to be ironic or controversial. They came from the heart, from his lived experience. Homer Simpson is a familiar friend, a human-like character present in our lives—and Tom presented him in a very human body experiencing the cross—a raw, incarnated, bleeding and broken body. I couldn’t stop looking at Tom’s crosses, so I bought them all and took them home with me. Every few days I would look at them. Art is a relationship – you have to spend time with it and wait for it to tell you its story. The process of art is completed in the viewer. I came to understand that these crosses were theologically accurate, aesthetically profound, and deeply confirming of the mystery of the cross— and of life. Perhaps the most significant religious art in this secular world, is produced by those who experience the cross everyday—the other, the outsider, the disadvantaged. In our day, perhaps the religious art that will fill us with awe and wonder is the art that is an expression of vulnerability, by those who are vulnerable. When this work touches us so deeply, so physically, it confronts us with the essential questions for our human survival—What does ‘being human’ mean? How are we to live this meaning personally in our human community? By the appearance of rule breaking, they redefine and reaffirm the gift of art and the life that it brings. Their work embodies the innate human response and desire to create a personal, physical mark—a prophetic gesture holding our fragile human identity in the strength of an intentional creative act – it is a way of ‘knowing’. We are privileged to have artists in L’Arche who have the ability to confound us. Jacquie Boughner is a professional artist, member of the L’Arche International Stewardship Board, member of L’Arche Daybreak and curator of the L’Arche International 50th Jubilee On-line Art Exhibition.